Yesterday afternoon my personal chauffeuse took me and my unwelcome medical attachment out for a swift jaunt. It’s good to get some fresh air and a change of scenery but there was a more pressing reason for our short trip. 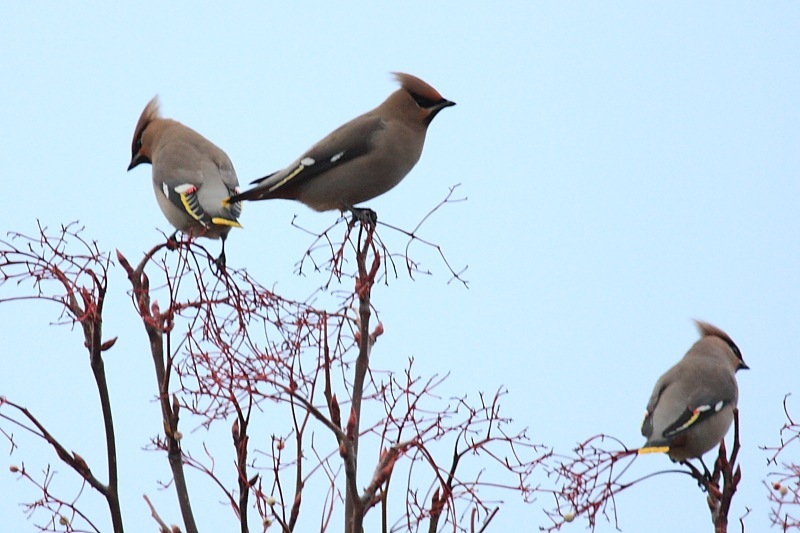 Word had reached us through Carol’s Greensand Trust connections that a flock of Waxwings (Bombycilla garrulus) had chosen Woburn as a base. 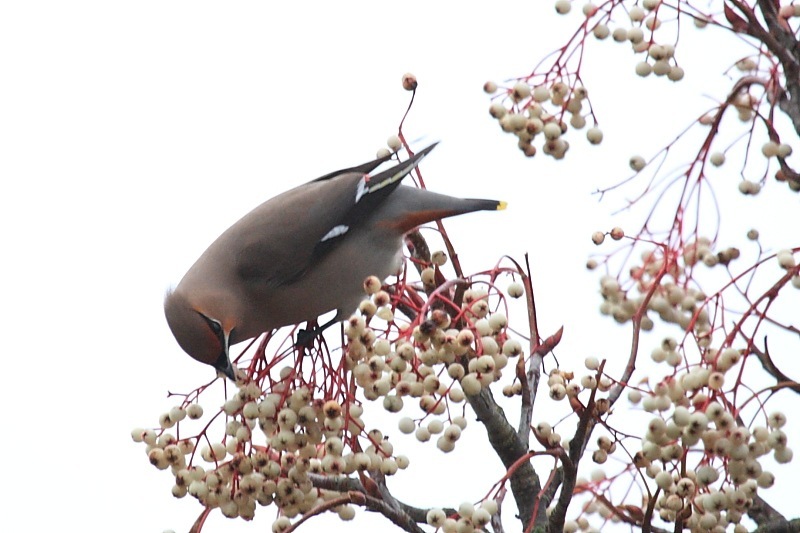 This was exciting news – we’d never before seen a Waxwing and were keen to investigate. Woburn may be a relatively small village but there are many trees, let alone the Duke’s large estate, and when you’re looking for highly mobile birds, mobile in three dimensions, no less, there’s a lot of relatively large haystack to search for a relatively small needle. We thought we knew the general area in which they’d been spotted and set off. A flock of 40 or so Waxwings was sitting relaxing in a bare branches of a tree a little way from the road, in some lucky person’s back garden. Oh to be in that house! Waxwings are colourfully marked birds and we should have come in the morning when the sun was out and would have made their colours sparkle. As it was the light was completely pants. From a distance they looked nothing special but modest binoculars revealed their distinctive crests. Beside the road were other trees in people’s front gardens bearing white berries. As we waited and watched, every now and then a few Waxwings would break away from the flock and flap over to the berry-laden trees, grab a few and flap back. Here, they were close enough for some of their colours to show. The light was still rubbish but I did manage to get a couple of recognisable Waxwing shots for the first time. Waxwings are as common as muck in Scandinavia, apparently. How delightful! Oh, and the berries were Sorbus (Whitebeam), I am informed by friends at iSpot. If these guys like it, get planting!